To achieve the goal of sustaining healthy diverse, and resilient coastal and marine habitats and living marine species in the Gulf of Mexico, resource managers need a way to take the pulse of this vast ecosystem, to evaluate its health and its ability to provide needed ecosystem services. The indicators of ecosystem health and condition measured by current monitoring programs is at best uneven across the range of ecosystems in the Gulf, hindering our ability to support sustainable ecosystem and living marine resource management. To address this need, NatureServe, in partnership with USGS, The Nature Conservancy, University of Texas, Austin, Florida Wildlife Research Institute, and the Ocean Conservancy, developed a recommended set of indicators to assess ecological resilience for five ecosystem types in the Northern Gulf of Mexico. Funded by the NOAA RESTORE Science Program, this project established conceptual ecological models for salt marsh, mangrove, seagrass, oyster and coral ecosystems to guide the identification of the indicators, the metrics used to assess them, and metric ratings that allow evaluation of ecological condition and ecosystem service provision. The study also provides a spatial analysis of the existing monitoring programs that are collecting data for the indicators to identify opportunities for additional data collection. This work is meant to help guide the collection of data that will inform living marine resource management, restoration planning and evaluation, damage assessment and recovery, and ecosystem health assessment. Goodin, K.L., D. Faber-Langendoen, J. Brenner, S.T. Allen, R.H. Day, V.M. Congdon, C. Shepard, K. E. Cummings, C.L. Stagg, C.A. Gabler, M. Osland, K. H. Dunton, R.R. Ruzicka, K. Semon-Lunz, D. Reed, M. Love. 2018. 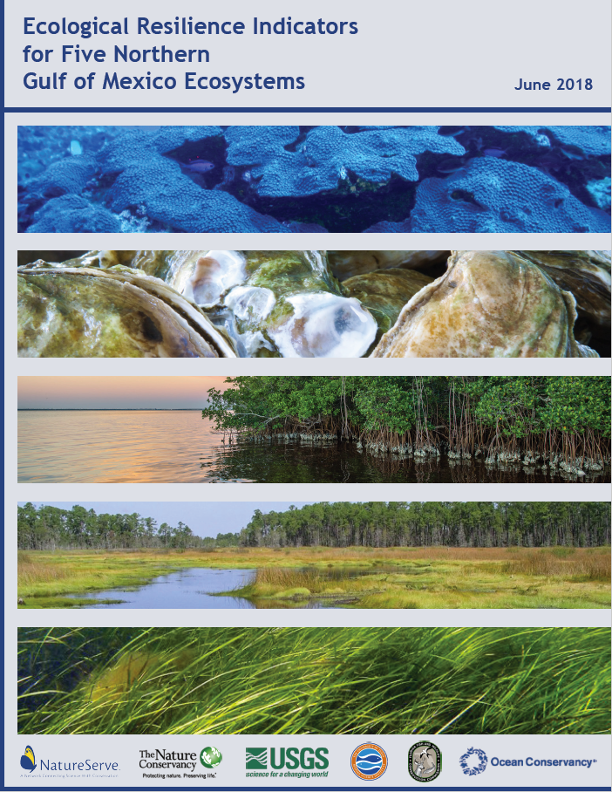 Ecological Resilience Indicators for Five Northern Gulf of Mexico Ecosystems. NatureServe, Arlington VA.